Lecture on the trauma ultrasound by Dr. Geoffrey Hayden @ emergencyultrasoundteaching. Listen to the podcast on tips and pitfalls here at EMcrit between Dr. Scott Weingart, the EMCC guru, and Dr. Lalek Gharahbaghian, US director at Standford and the creator of one of my favorite US sites, Sonospot. 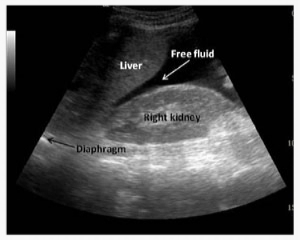 Learn why we perform the FAST scan (Focused Assessment with Sonography in Trauma), what the indications are and the basic principles behind the exam @ sonoguide.com. Lecture on the E-FAST (Extended FAST) @ Ultrasound village.